Using oscillating liquid streams, breakup and drop formation can be improved compared to common straight jets, but dynamic interactions make it difficult for scientists to understand the mechanisms behind this breakup. Now, researchers have simulated the breakup of an oscillating stream using numerical modelings. Their findings, published in Physics of Fluids, give a better understanding of how an oscillating jet achieves these results. In this image, disturbances propagate through a simulated stream of liquid shortly after it leaves the nozzle in this 3D rendering. The jet begins to deform and then break up into a spray farther downstream. Credit: Simon Schmidt, Oliver Krüger, Katharina Göckeler and Christian O. Paschereit. Atomizing liquids is vital to fuel-air mixing. Using oscillating liquid streams, breakup and drop formation can be improved compared to common straight jets. But the many dynamic interactions make it difficult for scientists to understand the mechanisms behind this breakup. Now, researchers have simulated the breakup of an oscillating stream using numerical modelings. 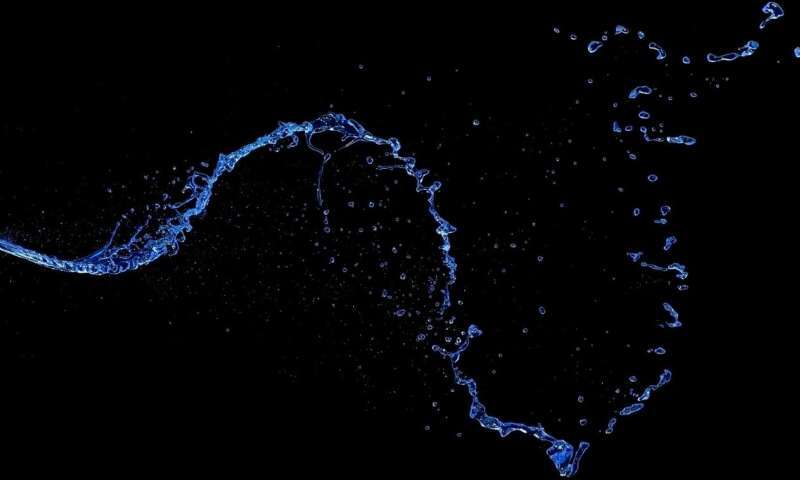 Their findings, published in Physics of Fluids, give researchers a better understanding of how an oscillating jet achieves these results. The report also offers a way to predict the device's behavior numerically, which could save time and money in industry. A team of researchers from the Technical University of Berlin and FDX Fluid Dynamix GmbH modeled the behavior of a jet produced by a fluidic oscillator. Instabilities in the fluid, surface tension and inertia all contribute to the deformation of a stream of liquid until it breaks into a spray. Turbulence also affects breakup. The researchers designed their model to account for all these factors. They found that an oscillating stream breaks into a wider spray of finer droplets than a straight jet, so it could find application in high-efficiency fuel injectors. "We knew the oscillation somehow increases the spray angle [and] you get better droplet distributions, but we didn't really know how this all worked together," said Simon Schmidt, lead author on the paper. For the best use of computing resources, the team increased the simulation's resolution near the liquid-gas boundary, while using a coarser grid in less critical areas. Most of the vorticity relevant to the breakup occurred along this boundary, so the refinement captured the important turbulence in great detail. The group identified two types of instabilities that triggered the breakup. The first type, also present in straight jets, is produced by shear forces between the surface of the liquid and the surrounding gas. The effect is strongest near the nozzle where the liquid's momentum exceeds that of the surrounding air. These Kelvin-Helmholtz instabilities create surface waves, which travel downstream along the jet. Secondary waves, which form across the surface, combine with these, causing the stream to eventually deform into lobes. The oscillation also generates a second kind of instability. These Rayleigh-Taylor instabilities appear when the liquid's surface moves perpendicular to the flow and crashes into incoming gas head-on. The two instabilities' combined effects break the oscillating stream more quickly than a straight jet dispersing it into smaller droplets over a wider arc. Unlike many past numerical studies, the team verified their results experimentally. They found that the behavior predicted by the simulations closely matched the real oscillating jet. The actual stream did appear rougher than the simulated one, which the team attributed to minute imperfections in the machined parts and fluid pressure, as well as their nozzle simplification. The researchers now plan to dive further into the underlying physics by simulating the fluidic oscillator at many different frequencies and amplitudes. Ultimately, they hope to develop a model for droplet size and dispersal that does not rely on an underlying simulation. The final simulation took two months to run, so achieving this ultimate goal could be a boon to industries adopting this technology.